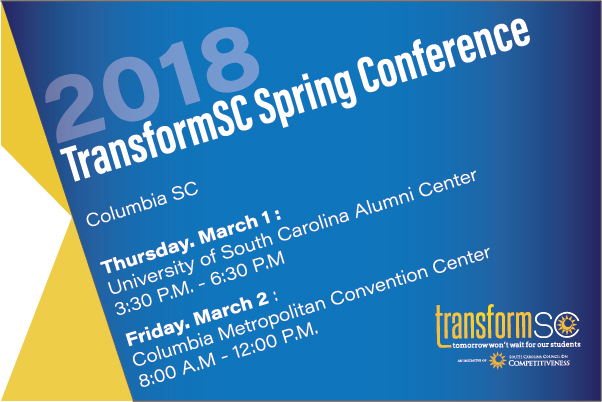 The SC Council on Competitiveness and TransformSC are excited to announce that the TransformSC 2018 Spring Conference: Transformation Through Data will be held March 1 & 2 in Columbia, SC. We’re excited to announce that our Spring Conference will be expanding into a two-day event in Columbia. The focus, on how to #TransformThroughData, will boast two keynote presentations, multiple breakout sessions and a reception event. For the full event agenda, please click here to visit our event webpage. The 2018 conference will bring together business leaders, policymakers and teams of educators, representing multiple school districts from around South Carolina. Join us in meaningful conversation and discussion about how to impact and help our education sector #TransformThroughData.